Amazingly, the Ramen Lovers blog has not reviewed a single American instant noodle up to this point. 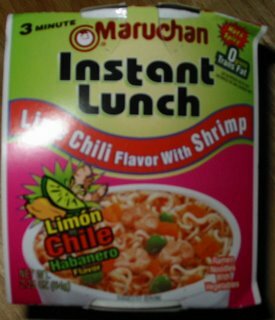 So at Ralph's last week, I decided to pick up the most disgusting sounding flavor of Maruchan just to prove once and for all the utter crappiness of American ramen. 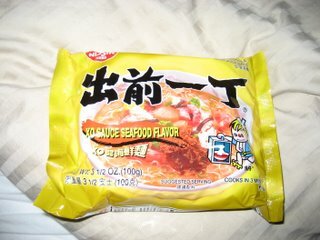 This particular one is Lime Chili Flavor With Shrimp. Maruchan's headquarters is just a stone's throw away from my office in Irvine, CA. Surprisingly, Maruchan has become immensely popular in Mexico, which may partially explain their headquarters' location in Southern California. This particular flavor may be designed to appeal to Mexican tastes, as it contains Lime and Habanero chili, both of which are commonly found in Mexican cuisine (and not in Asian cuisine). The Instant Lunch line of noodles comes with their own styrofoam cup, so all you need to do is fold back the lid and pour some boiling water in. 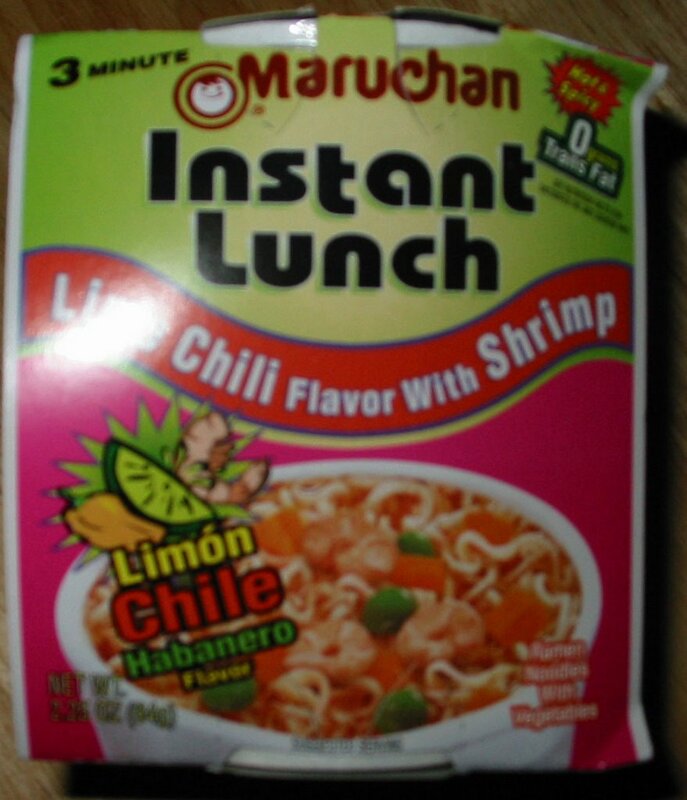 The biggest strike against the Maruchan brand is the cheap inferior noodles they use, and this one is no exception. They are extremely thin and completely flavorless. I guess Maruchan doesn't realize that good noodles can actually enhance the experience. I was shocked by how good the broth turned out. They certainly lived up to their billing, being extremely hot and spicy, yet with a strong flavor of lime as well. The dehydrated shrimp were a nice touch, instead of being disgusting as I had expected. 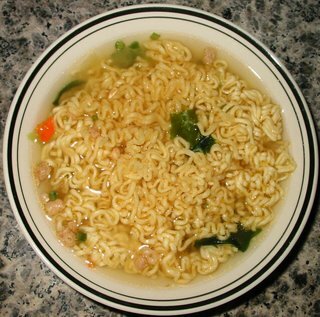 As with most Maruchan instant noodles, there is a pleasantly high amount of vegetables. 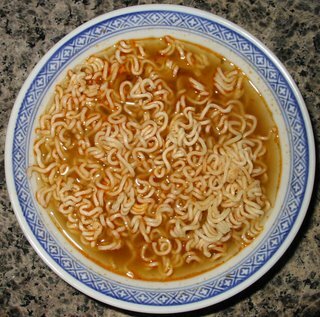 Overall, these had a very good flavor, but I wish the noodles themselves matched up to the surprisingly flavorful and potent broth. From the makers of the ubiquitous Maggi sauce comes these noodles. Even though Maggi is owned by Nestlé, these noodles are imported from Malaysia. 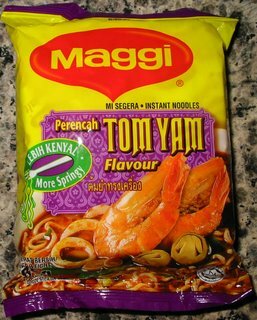 I had very high hopes for these, considering they came from a reputable brand and Tom Yam flavour seemed like a good idea at the time. As a disclaimer, I have never had Tom Yam soup before, but I have heard great things about it from friends. Wikipedia describes it as a "hot and sour soup flavored with fish sauce". Hmm, maybe that should have been my first warning sign. 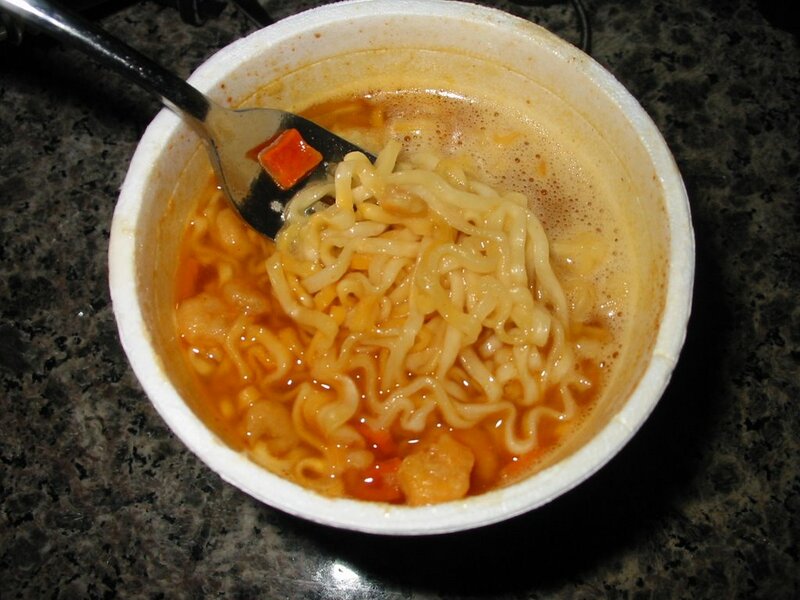 Sour and fish flavored things usually don't come off well in instant noodles. The additives to these noodles consisted of a powder pack and a sauce pack filled with a dark brown thick sauce. Looks innocent enough from the picture, right? But what you don't see is the pungent and noxious sour taste of this broth. These noodles are hot and spicy but are also disgustingly sour. To make matters worse, there is a strong fishy taste on top of everything. 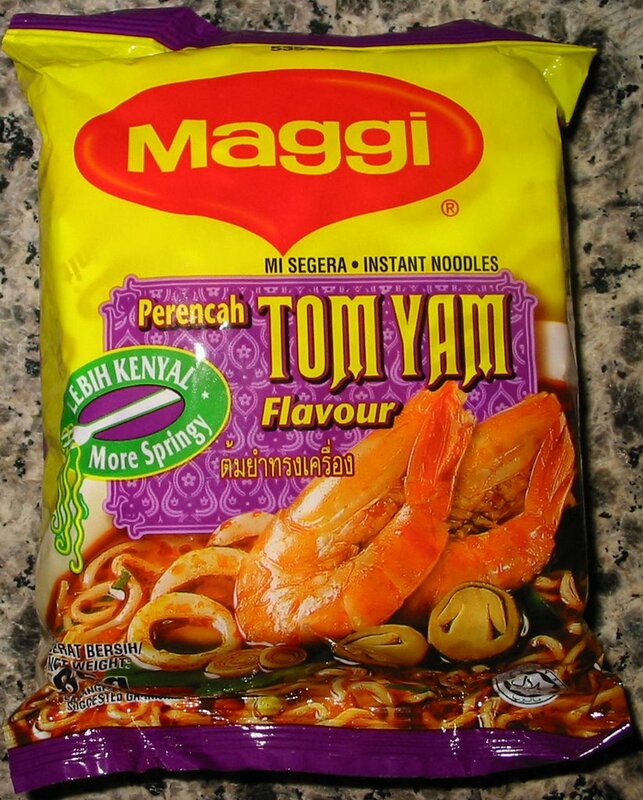 Maybe I just don't like Tom Yam soup, but I think these noodles are just plain bad. Maggi should stick to making sauces! As this ramen blog has established, the Nissin Demae ramen line is typically mediocre with cardboard-like noodles and very little flavor. 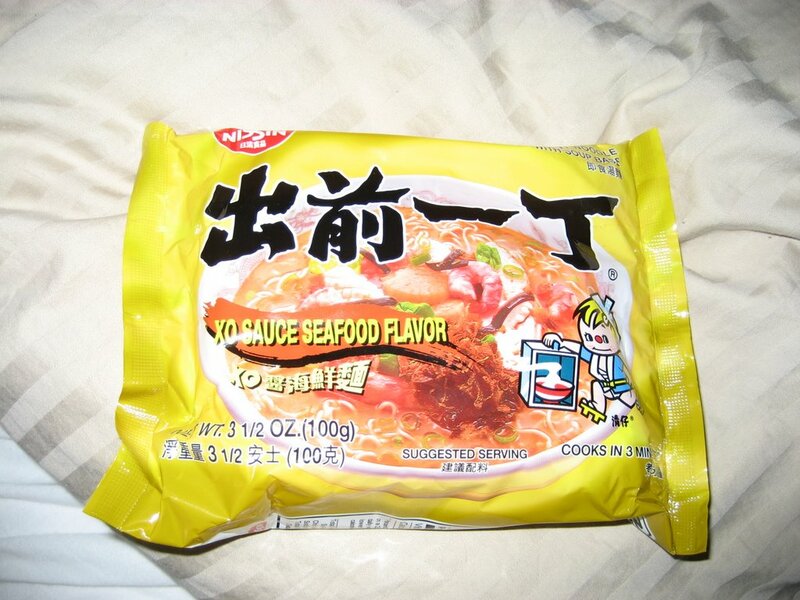 Nevertheless, I decided to the XO Sauce Seafood Flavor out of curiosity. What is XO sauce? The ramen comes with three packets - a soup base, "oil", and a brown paste. The soup base has some dehydrated green onions that plump up nicely in the soup. 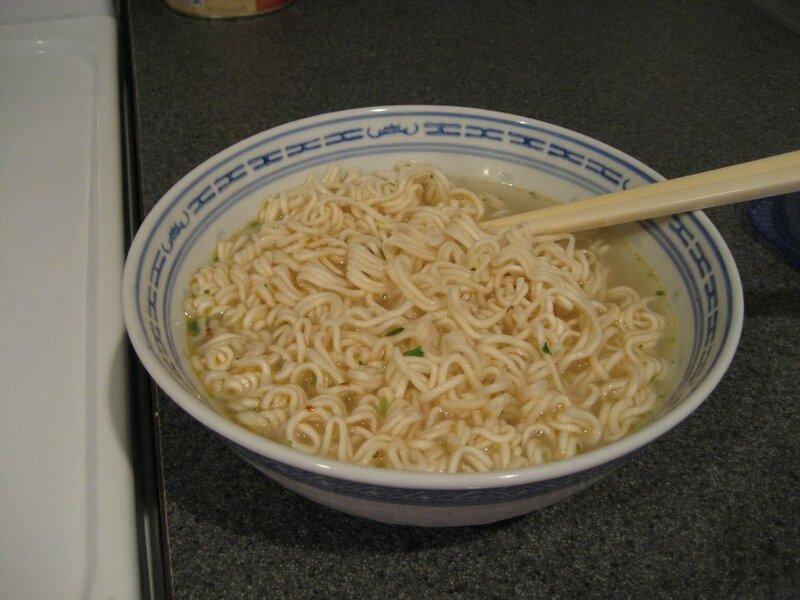 The noodles were definitely the typical Nissin Demae noodles - I could identify these in a blind taste test I think. The broth tasted quite strongly of the artificial seafood flavor common to instant ramen and the oil provded a nice creaminess to the meal. However, I'm still not sure what XO sauce is - it tasted somewhat garlicky. 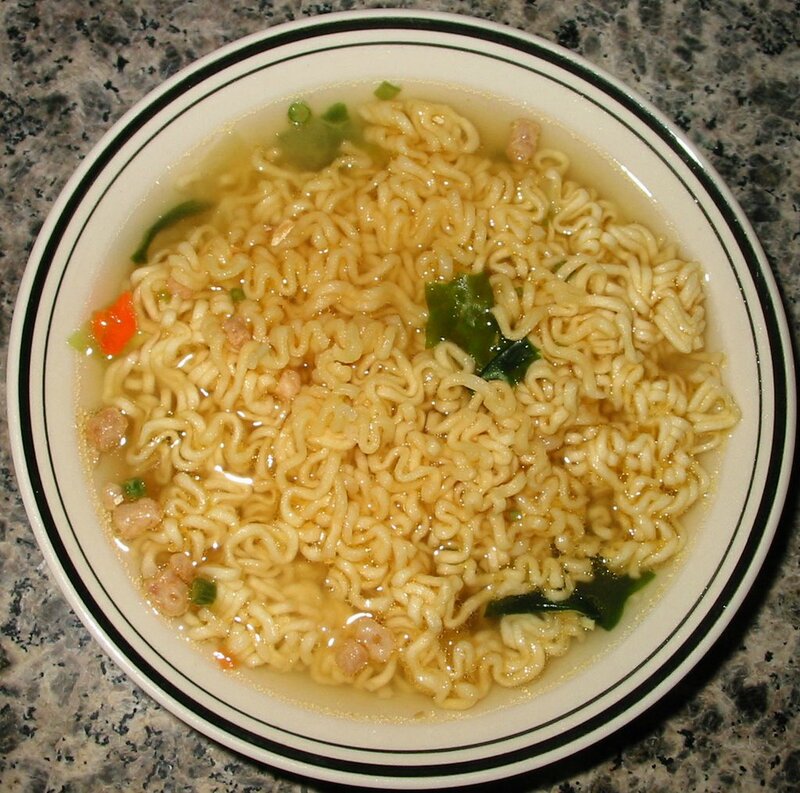 Nevertheless, this is probably my favorite of the Nissin Demae ramens that I've tried so far. 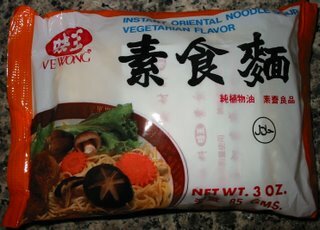 "Vegetarian Flavor" and "Instant Noodles" are not words that should go together, but I bravely picked this one up from the local 99 Ranch Market anyway. It's made by Ve Wong, which is a noodle company based in Taiwan. As you might expect, the powder packet contained a fair amount of dried seaweed and carrots which magically plumped up when water was added. The weird thing that there were some TVP chunks as well. TVP stands for "textured vegetable protein" and is used as a cheap meat substitute. But why would they be including it in something that was meant to be vegetarian flavored anyways? ?